$20/$10 for children under 12.
in West Asheville, off of Haywood Rd. there is limited parking behind the church building. >> Turn onto Balm Grove Ave, off of Haywood Rd. Handicap access: please park to the back of the church building, where there is a wheelchair lift. 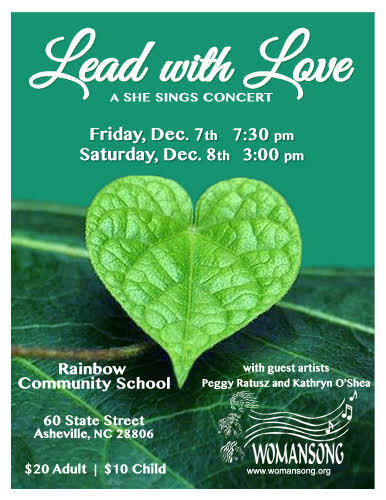 ASHEVILLE (Oct 1, 2018) Womansong, Asheville’s largest and longest-running women’s community chorus, invites you to our winter concert, “Lead with Love”, this year performing with outstanding local chanteuse, Peggy Ratusz and singer/songwriter, Kathryn O’Shea. 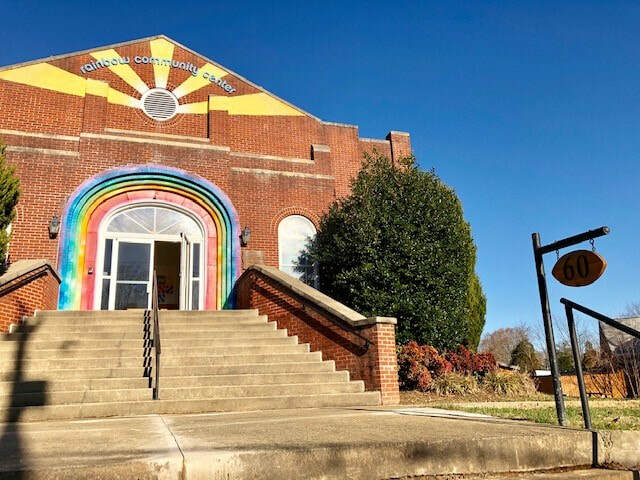 The concert will be held at Rainbow Community School Auditorium, 60 State St., Asheville, NC on Friday, December 7th at 7:30 p.m. and Saturday, December 8th at 3 p.m.
Peggy Ratusz (https://www.reverbnation.com/peggyratusz) is a popular figure in the Western North Carolina music scene, acclaimed for her “powerhouse vocals” and “infectious, sultry, multi-layered brand of original, traditional and modern Blues, Jazz, R&B and Soul music.” Kathryn O’Shea (http://www.kathrynoshea.net/) grew up singing with Womansong and now returns as a talented banjo-playing folk musician with a gorgeous voice. The concert theme “Lead with Love” comes from the title of one of our inspiring songs. Life is filled with beauty and it also has challenges that can leave us feeling vulnerable and scared. Yet, composer Melanie DeMore reminds us that we are not alone. We’ll be all right as long as we stay positive and keep moving on. We just “gotta put one foot in front of the other and lead with love”. Other numbers include Colbie Caillat’s “Try”, the delightful classic “Ac-Cent-Tchu-Ate the Positive”, the Woods Brothers’ hit, “Sing About It” as well as songs in Hebrew and Spanish. Womansong and guest artist Peggy Ratusz join together for Holly Near’s rousing anthem, “I Am Willing”. In true Womansong style, the audience will have plenty of opportunities to laugh and sing along. Concerts are accessible to the hearing impaired through music sign language interpretation by Shiner Antiorio. ​Directed by Althea Gonzalez and Assistant Director, Amanda Carroll, Womansong is a 75-member chorus that celebrates the unity, diversity and empowerment of women through musical expression. As a nonprofit, concerts help fund operations as well as the choir’s New Start Program, which provides scholarships and emergency funds to local women in need. Tickets go on sale Oct 22. Price is $20 for adults and $10 for children under 12. Tickets are available from any Womansong member, online at www.womansong.org or at the door.